This trip report was written by Neil Nikirk. Photos are also courtesy of Neil Nikirk. All of the trips in Colorado took place in July. The Selway and SF Payette launches were in early August. We have received several requests for information on the rivers that we boated this summer during our Colorado whitewater odyssey. So here goes. Many thanks to Kevin Clancy for the river guides he provided that helped us select the rivers to boat. 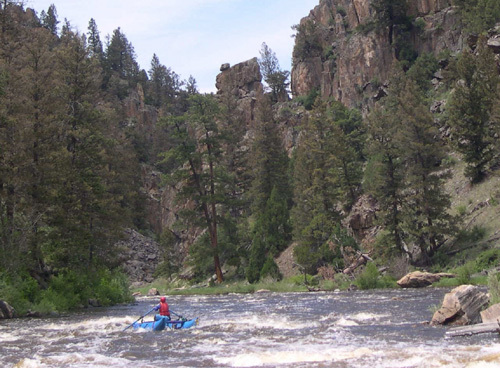 Descriptions of these runs are in “Colorado Rivers and Creeks” by Gordan Banks and Dave Eckardt and “A users guide to the wild and scenic Cache la Poudre Poudre River Fort CollinsRiver” by Bryan Greene Maddux. This is an excellent roadside river with sections from Class II (think inner tubes) to Class V+ (the narrows, gnarly). Access is similar to the Merced, a minor highway runs right along the river, providing many access points. We ended up doing the “profile rock and roll” section (Class III), the “rustic” run (Class III), “Grandpa’s gorge” (Class III+), “upper Mishawaka” (Class IV) and “lower Mishawaka” (Class III). All were very fun and scenic. We did most sections several times as they are relatively short. My favorite was the Upper Mishawaka. River level was between 3.5 and 4 feet on the Pineview Falls gage. We did not do the “Poudre Park” section (Class IV+) with Pineview Falls. Up and over the pass from the Poudre, straddling the Colorado/Wyoming border is the Northgate Canyon run (Class III). With the exception of one rapid, this run is mostly Class II. It is a very pretty canyon with excellent fishing. We did about 8 miles, but you could do 30+ miles and fish the whole way. Local anglers reported that they often catch 200 fish a day in there (catch and release, mostly). We saw bighorn sheep on a hike down river before the run. The takeout for the one-day run at Six Mile Gap campground is about ¼ mile up a steep, but good path. Think the revamped Tuolumne take-out, but at least twice as long… Flow was around 1500 cfs. On our way to the Arkansas, we stopped in and ran the “Dowd Chute” and “upper eagle” sections at somewhere around 1400 cfs. Dowd’s is a pretty straitforward mile long set of waves that was called Class IV. Definitely not a place to swim. Think of a shallow “meatgrinder” with sharp rock debris and very fast current… The upper Eagle is a fast, continuous Class II+ and III section that rolls past private houses, condos, and golf courses. Pretty mountain scenery if you can see past the development. The shuttle was interesting as we took public transit from the take-out to the put-in to get the truck. Excellent! The Arkansas is perhaps the most heavily used whitewater river in the country, but everyone goes on a couple of sections, leaving the rest of the river to people who don’t like crowds. We ran “Numbers” (Class IV), “Fractions/Frog Rock” (Class III-III+), played in the whitewater park at Buena Vista, and ran “Browns Canyon” (Class III) and the “Royal Gorge” (Class III). The combination of Numbers/Fractions/Frog Rock is a great one-day run down to the town of Buena Vista, with time to play on the surf wave in the whitewater park. There is a fair amount of use on the Numbers section, but can be avoided with proper timing. Almost no one on Fractions/Frog Rock. Numbers is a very fun section that reminded me of the Chamberlain Falls run on the NF American. Lots of Class IV, but easy to read and run (unlike Bogus Thunder). Fractions is full of fun surf waves and the whitewater park has a great wave, at least at the flows we saw, around 1200-1400 cfs. 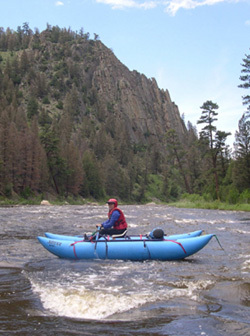 Browns Canyon is reputed to be the busiest whitewater section in the country. It was definitely crowded while we were there. Great scenery, so-so whitewater, not as exciting as the SF American at the 1400-1700 cfs we had. And they continue to run it down to 500 cfs… I can’t imagine how boring it might be at that level. There might be a lot of rocks to get stuck on at that level though. The Royal Gorge is a beautiful section of the Arkansas with a deep gorge, good rapids (watch out for the BIG holes), and great scenery. Alas, all this is somewhat spoiled by the presence of the train and railroad debris along the river, the helicopters buzzing up the canyon, and the multitude of commercial rafts with no clue about boat control. The commercial guides were extremely rude too. After nothing but “forward paddle” into a cluster f*&! of other commercial and our private group, one guide had the nerve to yell at me “look behind you, why don’t you” after I pulled into an eddy to escape the mess. Needless to say, I told the dumb*!& to look in front of him. I’m ready to go back and run the numbers, but can skip Browns Canyon and the Royal Gorge! The upper Taylor was a fun little Class III with a surprising amount of commercial traffic. Dam controlled and we had around 800 cfs making the run relatively continuous but fairly easy rapids. Bicycle shuttle as it was only about 5 miles. This is a pretty little canyon to run on your way through to the Gunnison. Supposed to be great fishing! Starts just below the famed “Black Canyon” of the Gunnison where you have to be both an accomplished Class V+ boater and rock climber to make it through, the Gunny Gorge is a more mellow (Class III) run through a very pretty canyon. The rapids were surprisingly easy, leading us to rate other later runs/rapids a bit differently. We would ask ourselves if that was a Class II or a Gunny Class III… Access to the canyon is down the Chukar Trail, about a mile. We had the local horse packer haul our gear down and carried our frames (they don’t break down) into the canyon ourselves. GO LIGHT. Three days later we were out at the Pleasure Park who shuttled our vehicle. Another river noted for it’s fishing. I think we had about 1100 cfs for our trip. Just when we thought our trip was winding down, Gary Rollinson had a great idea to run the Selway River in Idaho after the permit season ended. As we have a friend that lives near there, we headed that way and ended up doing 5 days on the Selway (minus Gary) at low water (1 foot on the gage). Hey, at least it was more than the last time (0.8 feet). This is a premier run that at low water is mostly a very rocky, technical Class II-III run. There is at least one Class IV at this level though, so not for beginners. We definitely will be looking at water levels next July to see if an early August trip will be possible. At the low water level, you definitely want to GO LIGHT. Think like a backpacker. Heading back from the Selway, we decided to travel along the Payette River to see if we could get any more river time. The NF Payette was running strong so we scrounged a promise of a ride for the Cabarton run (Class III). As we are waiting at the put-in, who shows up but Gary and friend! Excellent timing. So we ran that day with them and then camped with them along the SF Payette. The next day, we helped each other with shuttle so they could run swirly canyon and we could run the “staircase” section of the SF Payette and then the Main Payette. As you can see, we did a lot of rivers and runs. Part of what made the river part of the trip successful was having lightweight boats and gear that we could handle solo, being ready to go in minutes, and meeting some really neat people that let us tag along and more importantly provided shuttle. 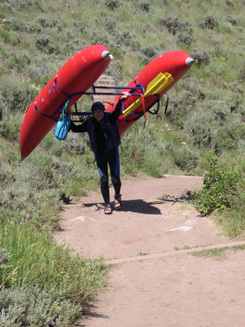 We run lightweight cat-a-rafts and our boats weigh less than 100 pounds (boat, frame, oars combined) so we can carry them to or from the river easily. We would love to do it again, run some of the same rivers and explore some new ones. If anyone is interested in next summer, who knows what could happen! Next time we will bring the fishing gear and learn how to fish.